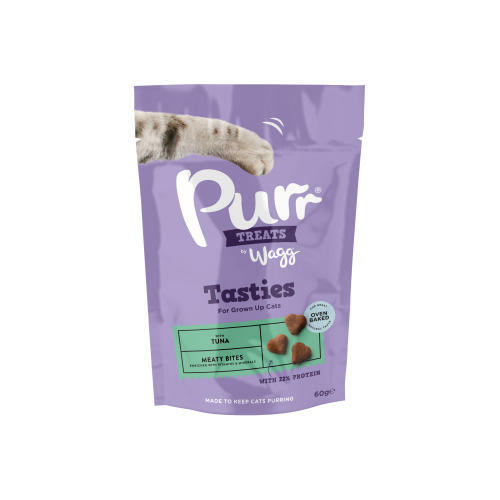 Wagg’prrrs are offered in 3 utterly delicious flavours each as tempting as the other for your cat. Designed to fed as a treat or reward between meals it won’t take long until your cat finds their favourite. Ingredients: Wheat flour, digest, vegetable oil, dried chicken liver (10%), gelatine, shrimp meal, rice, fish meal, whey powder, minerals, yeast, rosemary extract. Nutritional Analysis: Protein 27%, Fat content 20%, Crude ash 6.7%, Crude fibre 0.5%. Nutritional Additives: Antioxidants (tocopherol rich extracts of natural origin 1000mg/kg). Taurine 1000mg.Vitamin A 22,000 iu, Vitamin D3 2,200 iu, Vitamin E (all-rac-alpha-tocopheryl acetate) 250mg.Zinc chelate of amino acid hydrate 666.66mg, Manganese chelate of amino acid hydrate 333.33mg, Iron chelate of amino acid hydrate 333.33mg, Copper chelate of amino acid hydrate 49.98mg, Organic selenium S. cerevisiae CNCM I-3060: 43.47mg, Calcium Iodate Anhydrous 2.34g. Ingredients: Wheat flour, liver digest, vegetable oil, dried chicken liver (10%), gelatine, shrimp meal, rice, fish meal, whey powder, minerals, yeast, rosemary extract. Nutritional Additives: Antioxidants (tocopherol rich extracts of natural origin 1000mg/kg). Taurine 1000mg.Vitamin A 22,000 iu, Vitamin D3 2,200 iu, Vitamin E (all-rac-alpha tocopheryl acetate) 250mg.Zinc chelate of amino acid hydrate 666.66mg, Manganese chelate of amino acid hydrate 333.33mg, Iron chelate of amino acid hydrate 333.33mg, Copper chelate of amino acid hydrate 49.98mg, Organic selenium S. cerevisiae CNCM I-3060: 43.47mg, Calcium Iodate Anhydrous 2.34g. Ingredients: Wheat flour, digest, vegetable oil, dried chicken liver, gelatine, tuna meal (4%), shrimp meal, rice, whey powder, minerals, yeast, rosemary extract. Nutritional Analysis: Protein 27%, Fat content 20%, Crude ash 7.2%, Crude fibre 0.5%. Nutritional Additives: Antioxidants (tocopherol rich extracts of natural origin 1000mg/kg).Taurine 1000mg.Vitamin A 22,000 iu, Vitamin D3 2,200 iu, Vitamin E (all-rac-alpha-tocopheryl acetate) 250mg.Zinc chelate of amino acid hydrate 666.66mg, Manganese chelate of amino acid hydrate 333.33mg, Iron chelate of amino acid hydrate 333.33mg, Copper chelate of amino acid hydrate 49.98mg, Organic selenium S. cerevisiae CNCM I-3060: 43.47mg, Calcium Iodate Anhydrous 2.34g.